LThe last Dreamworks movie is already in theaters in Spain, and obviously we already have the Birthday Invitation Baby Jefazo in high quality to print ... as always for free! Also on this occasion we also add a special Bonus consisting of a "Welcome to my Baby Jefazo" poster and a "Thank you for coming to my boss baby party" card. In Latin American countries it has been titled "Un Jefe en Pañales"
It is based on a book written by Marla frazee, that at the same time also made the funny illustrations. In the original version, it has been Alec Baldwin who has put the voice to our protagonist, while in Spain it has been José Coronado. 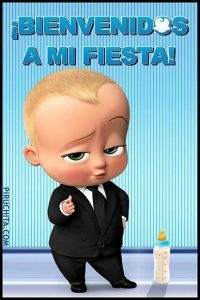 Download the welcome sign to my Boss Baby party at the end of this page. Tim, a child of 7 years with a great imagination and a high knowledge of the world of children, tells the story of how life changed the arrival of a new baby to his family. 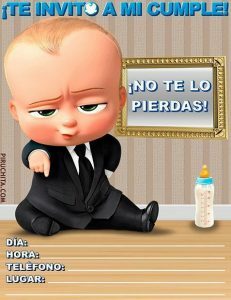 The entry made by the baby, is in itself the most curious, since the Baby Boss arrives at Tim's house in a Taxi, perfectly dressed and with a briefcase. As in most houses, sibling rivalry is imminent from the start, as the new baby steals the role and the perfect life that Tim had. But one day Tim discovers that his new little brother is actually a spy on a secret mission, and only he can help him in an epic battle between puppy puppies and babies. It is a very unusual baby. She is wearing a suit, a briefcase and is on a secret mission to discover why babies are losing their place in the love market. To fulfill this mission, he will have to join forces with his older brother, Tim. He is a normal boy with an extraordinary imagination. His perfect world goes to pieces when his new brother arrives. 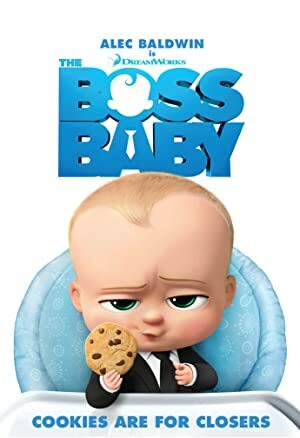 Convinced that Baby Boss is different, he is determined to discover the truth. They are the loving and exhausted parents of Tim and the Baby Boss. Happily unaware that their new baby is a little different, they become unwitting pawns of the Baby Boss's secret mission. He is the charismatic and slightly deranged President of PuppyCo. He is determined to put BabyCorp out of the baby's business and will stop at nothing to achieve it. He is the older brother and right hand of Francis. His job is to ensure that no one interferes with Francis's diabolical plan to achieve market dominance. Designed to stay always like a puppy, it is the most curious and adorable hair ball ever created. Obviously the little ones are having fun in the rooms of all the cinemas with the movie thanks to their animated characters, the colorful, great animation, etc., and they release several laughter. In this case Dreamworks has not made an effort to make a film that equally appeals to children and adults, because with Shrek we could find many situations that were obviously not understandable for children but that also laughed imitating the laughter of parents. After watching the film is although you can doubt if it tries to convey an overly conservative message where it rewards the importance of family, birth, etc ... or if it is an ironic way of making fun of these forms of behavior, I think it has been done thinking more about the first option. In IMDB you get an 6.5 / 10 average over 10.000 ratings. Watch here. In Sensacine you get an 3 / 5. Watch here. The arrival of a little brother completely disrupts the idyllic life of little Tim, until then the only son of 7 years and the right eye of his parents. His new brother is a peculiar baby, who wears a suit and tie and wears a briefcase. Tim begins to suspect him, until he discovers he can talk. You can find more videos and games online on the official page of "El Bebé Jefazo" here. Have a very happy and fun party!